Meanwhile, Conor O’Shea’s Harlequins lost out as Clermont advanced to the Heineken Cup quarter-finals. 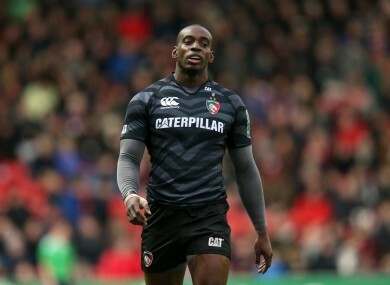 Miles Benjamin scored two tries for the Tigers. AFTER A BRIEF scare in the first half of a 34-19 win over Treviso, Leicester Tigers set up a potentially thrilling clash with Ulster in Pool 5 of the Heineken Cup next weekend, with the winner set to top the group. Leicester looked to be well on track in the opening exchanges at the Stadio di Monigo, particularly when Julian Salvi crossed for a ninth-minute try to cancel out former Leinster out-half Matt Berquist’s opening penalty. However, after Owen Williams was wide with his conversion attempt, Treviso burst into life and deservedly scored a close-range try through prop Lorenzo Cittadini in the 18th minute. Berquist added the conversion and then tacked on a penalty shortly after. Williams punished the Italians’ indiscipline on the stoke of half time to leave the scoreline 13-8 in the home side’s favour at the interval. Richard Cockerill’s men presumably were on the receiving end of some stern words during that break, although they conceded to another Berquist penalty a minute into the second half. That sparked the Tigers into more decisive action, with wing Miles Benjamin beating two defenders out wide to touch down in the left-hand corner, drawing his side back to 16-13. Williams was once again off target with his place kick, but the Treviso defence was starting to show signs of weakness. Kiwi playmaker Matt Berquist slotted his fifth kick of the day to give Treviso a six point lead in the 50th minute, before substitute David Mélé responded in kind swiftly. With Toby Flood moving in to out-half from the centre and Brendan Williams sent to the sin bin for the Italians, Leicester began to assert some dominance. Mélé kicked a second penalty, before powerful play from the Tigers’ forwards led to a penalty try and the French scrum-half was on hand to convert that too. Benjamin then scored his second of the game to secure the bonus point for the Tigers as Treviso tired defensively. Mélé’s late penalty completed the scoring for a Leicester side that Ulster will feel are beatable. Nick Evans helped ‘Quins to victory over Clermont. Gareth Fuller/PA Wire/Press Association Images. Elsewhere, Clermont secured a crucial 16-13 win away to Harlequins in Pool 5 to ensure progress to the quarter-finals with a game to spare. Conor O’Shea’s side impressed in attack, but the Top 14 club’s power told in the end. Out-half Brock James got Clermont onto the score sheet early on with a penalty, but it was Harlequins who were the first to conjure a try, and in magnificent fashion. Danny Care was integral to the score, first releasing Ugo Monye with a lofted pass, and then producing a sublime flick pass inside to Matt Hopper after Chris Robshaw had chipped down the left-hand touchline. Hopper had a clear run to the line, and Nick Evans added the conversion. The former All Black was successful with two penalties in the first half too, providing Harlequins with a 13-3 lead at the break. Clermont enjoyed the better start in the second period, with Morgan Parra’s low box kicking bouncing awkwardly in front of Mike Brown, allowing Napolioni Nalaga to hack through and dot down for the try. James was off target with the conversion, and with Clermont’s attacking play lacking its usual incision, Vern Cotter had a lengthy wait for their next score. It came in the 72nd minute, when quick hands from fullback Jean-Marcelin Buttin freed Sitiveni Sivivatu on the right-hand touchline. The 31-year-old demonstrated that he still has searing acceleration amongst his skill set, bursting forward to score. James was off target with the difficult conversion, setting up a nail-biting finish. A 76th minute penalty by the Clermont out-half proved to be the winning score as the French side held on to see the game out. Email “Leicester set up winner-takes-all Pool 5 decider with Ulster ”. Feedback on “Leicester set up winner-takes-all Pool 5 decider with Ulster ”.